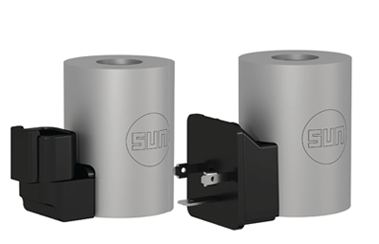 Sun Hydraulics SunFLeX | Fluid Power, Inc.
Sun Hydraulics has introduced the first in a family of new solenoid valves and coils for the mobile and industrial markets, the Sun FLeX Series. This new valve family was designed to achieve design goals of high performance and high reliability, with lower pressure drops compared with competing product, and ten million cycle reliability. Direct acting, pilot operated, and electro-proportional valves are available. Three solenoid coils are available: an energy saving low power 17W coil, a high power 25 watt coil, and a Hazardous Environment 30 watt coil. Valves and coils are zinc-nickel coated to offer 1,000 hour salt fog protection. These products are priced to target more price sensitive applications. 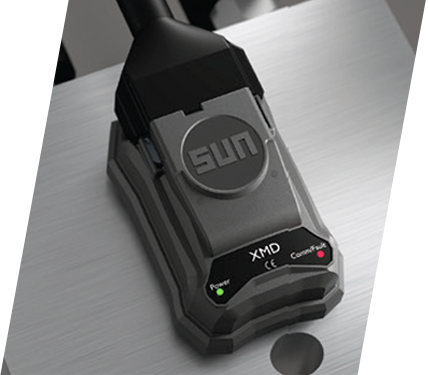 The Sun FLeX Series is compatible with Sun’s new XMD Series single- and dual-coil drivers for both industrial and mobile markets. The drivers are rugged and may be considered for the extreme environmental conditions seen in mobile hydraulic markets. 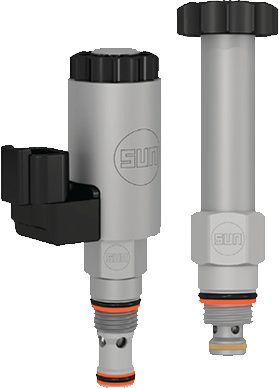 The use of these drivers is not limited to the Sun FLeX series of valves. They may be used with any electro-proportional or switching valve. The drivers may be configured easily through a free BluetoothTM app on a mobile device. Reliable solutions may be quickly achieved through the use of single- and dual-coil profiles of typical pressure and flow configurations. Custom outputs are supported for custom flow pressure curves or joystick tuning using universal inputs and CAN-received messages.